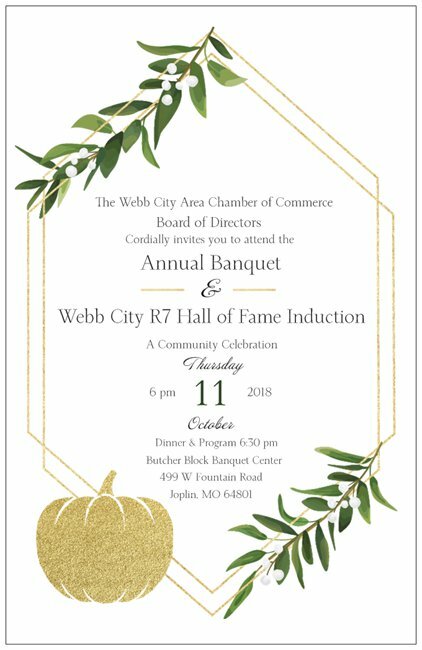 The Webb City Area Chamber of Commerce announces award recipients for the 2018 Annual Banquet. Several of our awards this year will be announced that evening including the Robert J Baker Champion Booster and the Historic Preservation Award. The 2018 Outstanding New Member of the year will be presented to Kona Ice, Chamber Man of the Year will be presented to Wesley Barnum and the Business Leader of the Year will be presented to Southwest Missouri Bank. The chamber also recognizes a City of Webb City Employee each year for their dedication to the city and that award recipient is Sergeant Michael Larery. Cardinal Teachers are Leslie Roy, K-2; Beverly Carpenter, 3-4; Timothy Manes, Middle School; Caleb Wheeler, Junior High; Dustin Craft, High School. The banquet also includes the induction of a honorees into the Webb City R-VII School District Hall of Fame. The school district Hall of Fame honors former students of the high schools that now make up the Webb City R-VII school district. The 2018 Inductees are Rex L. Tabor, Jr, Class of 1968 and he is an Operatic and Comedic Stage Performer and David Morris, Class of 1984 and he is an Exercise Physiologist. The banquet will be held at the Butcher’s Block Banquet Center, 499 W Fountain in Joplin with a social at 6:00 pm and the dinner and program will begin at 6:30 pm on Thursday, October 11th. $35 per person. Contact the Webb City Chamber of Commerce for reservations by emailing gwen@webbcitychamber.com or calling 417-673-1154.